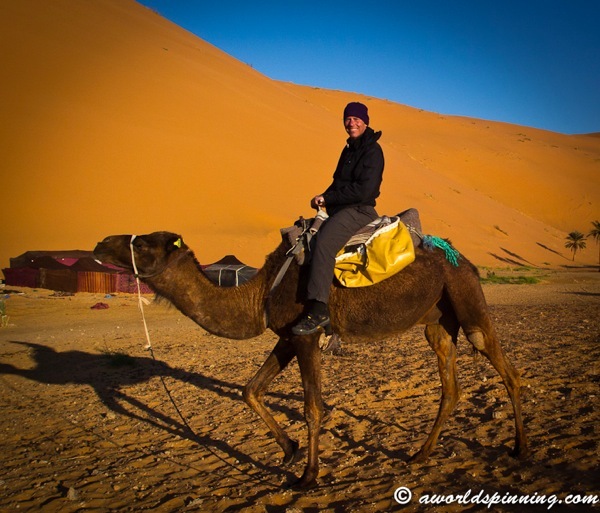 When I returned home after cycling over 5000 miles from Ireland to Morocco I no longer cared to own a car. 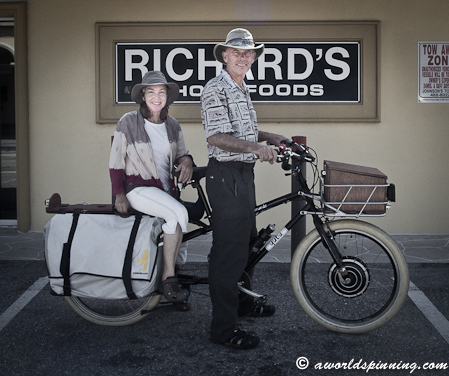 What’s a bicycle trip to the grocery store if you have spent 5 months doing this? I resolved to be car free. I know my weaknesses and knew that when it got hot and muggy I would cheat. So I decided to build a bike that would not lead me to temptation, but deliver me from evil, especially when the Florida weather got hot. An electric cargo bike would allow me to ride when it is hot, arrive decent, and carry everything. There would be no inner car/bicycle debate. 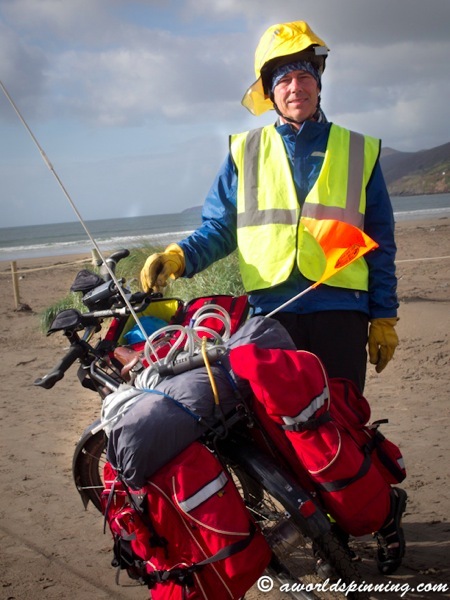 But this bike, to be a true car replacement vehicle, would need to travel 75 miles on a charge and tote a week’s worth of groceries and my girlfriend – all at the same time! My needs were more demanding than the products on the market could fulfill so I chose to assemble my bike. 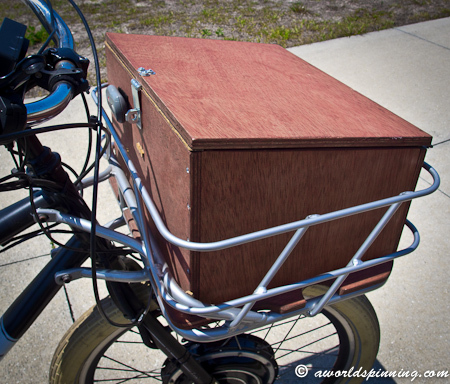 I bought a Yuba Mundo frame with panniers and a front basket. 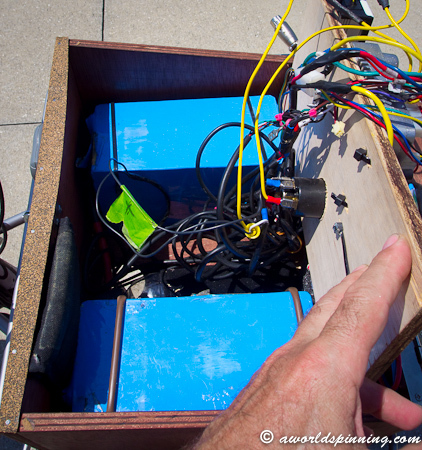 I used a Ping 36-volt, 30-amp battery and a Golden Hub Motor that I have had on several other ebikes. I bought new Schwalbe Fat Frank tires. They are cushy and support 330 pounds per tire. I used a 7-speed internal hub that I had on another bike, and a 3-gear chain-ring in front. I added a car headlight sized 2200-lumen LED front light from Super Bright LEDs, and an LED truck flasher on the back. I converted the voltage to power the LED lights from 36 to 12 using a Green Galaxy Dc to Dc converter from Thunderstruck motors. 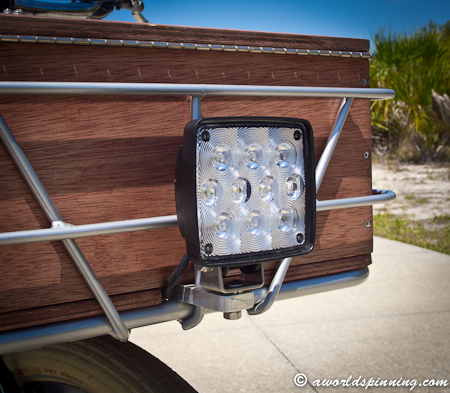 The lights burn just 20 watts and add enormous visibility and safety. I use a Cycle Analyst as an energy gauge, and find it invaluable. 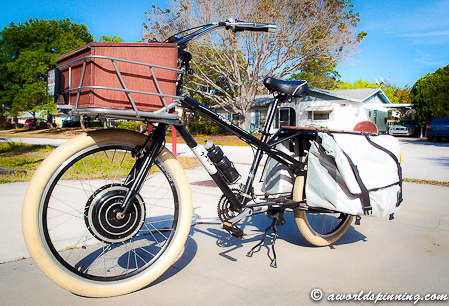 The battery weighs 25 pounds and is mounted in the front basket. It helps balance out the weight when the tail of the bike is loaded. I would have preferred to mount the battery lower, but I needed extra space to carry a larger battery. Because the Yuba front basket does not turn with the handlebars, the weight is not noticeable once underway, and I can even ride with my hands off the handlebars. 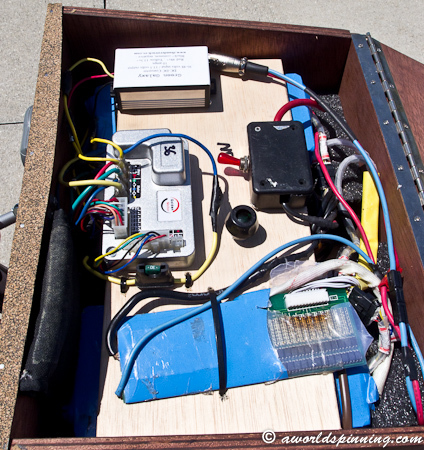 The front “hood” has proven to have other benefits, as there is plenty of space in there to manage the wiring and to store small valuables. One problem with the Yuba Mundo is that there is no place for adult passengers to put their feet with the panniers attached. So I built a couple of fold-out aluminum “wings” as heel rests. Later I will make a set of stirrups! Also, because the bag bottoms extend beyond their floor, the bags tend to slide outwards, pivoting from their top mounts. I put some small holes in their sides and zip tied them to the frame. How efficient is it? At 6 cents per kilowatt hour, burning 15 watts a mile, an ecargo bike will travel 3200 miles, across the USA, for under $3.00. A 10-mile jaunt will cost less than a penny. Because of their low energy requirements, they can be easily charged by photovoltaics. Just connect whenever the bike is at home and your ride is powered by the sun. I once carried 380 pounds of golf cart batteries for my home photovoltaic system on my ecargo bike! How Green is that? In addition, all the pleasures of cycling are yours when you ride an ecargo bike; the wind in your face, being outdoors, taking routes that cars don’t frequent, moving at a relaxed pace, the mild exercise. An ecargo bike still allows you to pedal as hard and go as fast as you can. You can ride with the motor on or off. But with cruise control and regenerative braking (like a Prius), you can also relax if you want a break. It is nearly as fast as a car for short errands, say an eight mile round trip. Like cycling, you ride different routes, smaller streets, take all the shortcuts, ride bike trails and cut through grass. Whee! On longer trips, say 50 miles round trip, it takes about twice as long as driving. The bike spends less time sitting at lights relative to the time spent moving, and hence is closer to the trip time of a car then you would think. 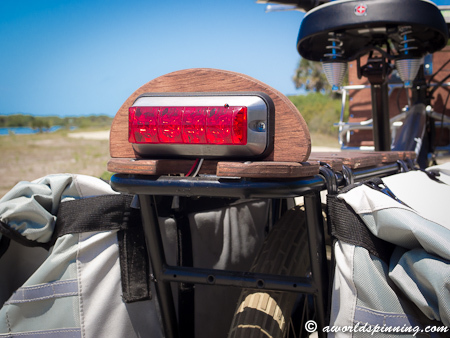 At stoplights, the bike goes to the front of the line. Still, I sometimes get impatient. So I ask myself: How much time would it take for a workout and to earn money for gas, insurance, registration, car repair and a car payment? Remember that these statistics include children on bicycles. Riding defensively with foresight of how drivers might behave, using lights and a safety vest for visibility, using a rear view mirror, riding courteously and obeying the traffic laws, all push the odds even further in your favor. And what about the health benefits of the exercise? According to Pedaling Health, an Australian publication, a person who bicycles six hours a week reduces his chance of death by coronary heart disease alone by over four times as much as he increases his chance of death through a traffic accident. Mayer Hillman of the British Medical Association has estimated that the total health benefit of cycling is twenty times the risk. The risk of pulmonary heart disease is 1000 times greater than the risk of death from cycling, and 3000 miles a year on a bike would go a long way towards preventing it! Mom, do we need a loaf of bread? How about a half gallon of milk? How about canned ravioli? I don’t see any…. Give me the car keys, I’ll go get some for you!